Zika virus is destroying cells and bones during brain-formation and growth before and also after baby’s birth. It also destroys new neuron cells in the brain of children. This does not increase the normal development of children’s nervous system. So, Zika infected baby’s nervous system normal development is not growing. After the birth of the baby, the complex neuro-disease is being attacked. Zika Virus makes them more crippled or mentally disabled. Babies are growing up with distorted head and immature brain due to Zika virus. New England Journal of Medicine published a study, it shows that in the past one and a half years, there are at least five thousand children born in Brazil with Zika virus, whose head is distorted or they are brain is immature. The kind of brain science says, “Macrophages”. Johns Hopkins, Florida State, and Emory University’s virus experts and researchers carried out a large study on Zika children’s brain tissues. On that research, they artificially inject Zika virus on baby’s brain. Three days later, Zika virus destroys 90 percent of neurons in brain cells. One-third of the neurons are completely drained. And two-thirds of the neuron stopped the growth. Researchers conducted the test on the brain cells of newly born children. According to them, there is more damage to the Zika virus when baby and baby’s growth in the mother’s womb. Researchers also have found that the “main goal” of the Zika virus is to children’s brain cells, neurons, and nerves system. After that, Zika attack kidney cells and when embryo became big than their brain cells and artisans and nervous system are being attacked. Zika Baby in Brazil is suffering from severe eye disorders. Doctors believe that there having a problem with their hearing. “Optical nerve and retina of more than half of 135 babies in a rehabilitation center placed the northeastern city of Brazil and their eyesight is also very low.” ophthalmologist Camilla Ventura said. And most of the babies are cross-eyed. Their eyes have been damaged since birth. 40 to 50 percent of them have serious complications. After the outbreak of the Zika virus, 3,893 infants have been reported to have been born with small brains in Brazil since October 2016. Where at the same time only 160 children were born with such problems. The World Health Organization has already issued worldwide warnings. Bangladesh is not even outside this alert. So we should know about this disease. Human awareness and cautions are helpful in the treatment of any disease. Identification and naming: Researchers identified this virus in 1947. Uganda is a forest named Zika. The virus has been identified in forest monkeys as the name of the forest researchers named Zika Virus. Affected area: Never worry about the worm virus. Suddenly, in the last two years, it has been spreading in South America. In Brazil, the Zika virus spreads rapidly. Currently, this virus is spreading rapidly in South and Central America, it seems that experts are spreading quickly, experts say. That’s why being asked to be careful. How it spreads: Zika virus spreads through Aedes aegypti mosquito. This mosquito, Dengue virus also spreads. The virus can spread viruses among healthy people through the virus. Symptoms: Signs that may occur when the gastric virus is infected – fever, headache, eyes rising, bone pain and skin red. The intensity of the disease: The news of hope is that there is no serious problem with this virus. Within five to seven days the disease is cured. The probability of death is almost zero. 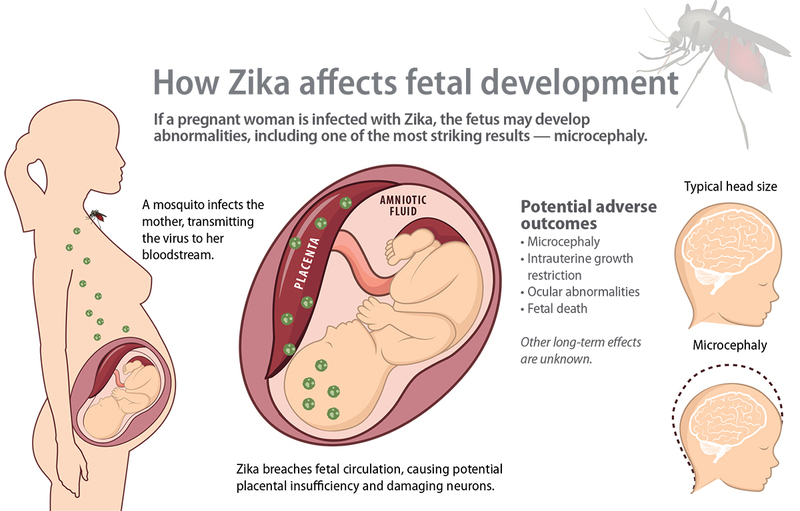 If the pregnant women get infected with the Zika virus then problems may arise in the normal development of the pregnant baby. Especially in the full development of the brain can be disturbed, which is known as Macrophages. In Brazil, a few thousand children suddenly grew up with small heads compared to normal. Many people think that this could be due to a Zika virus. However, there is no definitive evidence of experimental evidence about the fact that this has happened to the Zika virus. So, when Zika gets infected with the virus, the pregnant baby may be micro fly – thinking that people are excessively fearlessly. Remedies and Prevention: No vaccine or specific medicines have yet been invented for suppressing the Zika virus. The affected patient has enough rest. Drink plenty of food should be eaten. According to doctor’s advice, you have to take medicines. The way to get rid of this virus is to keep yourself safe from mosquitoes. Keep house-house free from mosquitoes. Clean the bush Prevent the spread of mosquitoes. Use spices and mosquito nets. Stay safe from the affected person. Zika virus causes Birth defects that can occur at any point of pregnancy. Now scientists know that the first three month of pregnancy risk of constricting Zika is very high. A new study suggests that early pregnancy in a risky time because the Zika virus tricks a pregnant woman’s immune system so that it makes Zika easier to spread in the embryo. Mr. Jae Jung professor and chair of molecular microbiology and immunology department at the Keck School of Medicine of USC said, “We have found that Asian Zika virus evolved to infect mother’s immune system and ultimately birth defects.” Mr. Junk study published in the Journal of journal Nature Microbiology. Junk study showed that the Zika virus to hamper the immune response of pregnant women targeting specific white blood cells. The body’s immune system attacks a foreign invader, and pregnant women’s immune systems are naturally suppressed to prevent an embryo from a resistant reaction. However, this means that pregnant women are also infected with the virus. Jung and his team said that in a study they found Zika took advantage of the weakened immune system and cause a pregnant woman’s immune deficiency to be lower than usual. Researchers collected blood samples from 30 healthy people aged 18 to 39 years old. This sample comes from pregnant women, women who are not pregnant and men. Researchers infect African and Asian Zika viruses (Asia’s Zika strain responsible for the most recent outbreak) and compared their blood test results to five healthy pregnant women and 30 Zika-positive pregnant women. When researchers look specifically at pregnant and non-pregnant women infected with blood, they notice that the virus targeting specific white blood cells and targeted white blood cells turn into big white cells called macrophages, which is cells debris. Researchers have found that Asian Zika virus strains macrophages as “M2 macrophages”, which cell that signal that the body is healing and stop immune system activation. Jung says that by cheating Zika virus impel to thinking the immunity system that the infected place is healing than Zika is allowed continuing more damage. Prior research shows that zika is replicating itself in the placenta of the pregnant woman and in the brain of an embryo. Pregnant women naturally have high levels of M2 macrophages and researchers have found that Asia’s zika virus is enough to increase M2 macrophages and reduce the number of white blood cells which reduce the number of infections. The African zika virus causes a similar increase in M2 macrophages, but the Asian strain has significantly added more. Pregnant women were also exposed to a suppressing immune system from the virus, but the effect was very strong among pregnant women. Generally, the Asian Zika virus increases the immune system suppression by more than 70% said the study author. Jung said that his study shows that the immunity system is the difference between a pregnant woman and a non-pregnant woman, so a vaccine effect may differ. So a pregnant woman should be included in the tests. good post mate, u had written an excellent knowledgeable post.